It is very difficult to catalogue the exact history of ex-Eastern Bloc tanks. 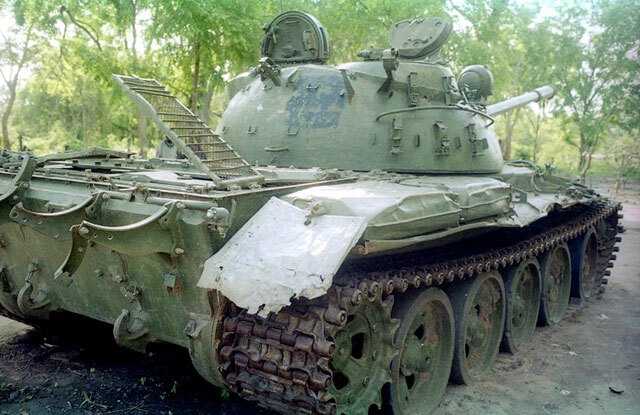 For example, I have been tracking the history of a model of mine (a T-54A/B) in Afghan service. It was originally built in Poland during the 1950s. It then served in the Polish Army through the 1960s before being sent to a second-line unit for another ten years. In the 1970s it was sold to Iraq. In the 1980s it seems to have been again sold to Pakistan and then sent to Afghanistan in the late 1980s, during or after the war against Russian. It may be still be in service today. 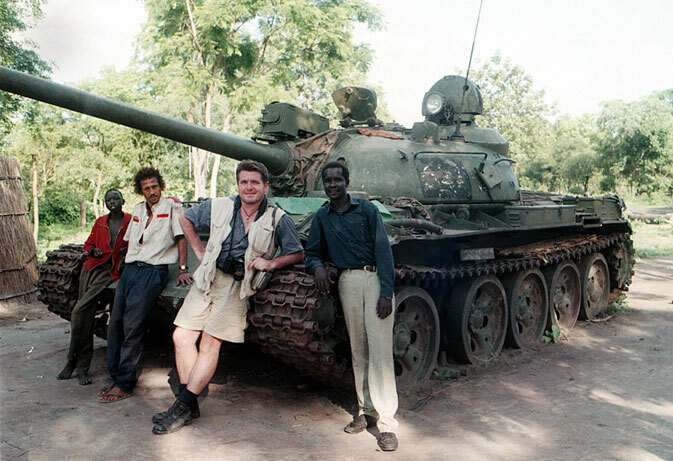 So, as you might gather, as the widest exported tank in history, the T-55 is very difficult to catalogue with scientific precision. Indeed, it is probably much easier to identify a dinosaur's bone than a man-made T-55! 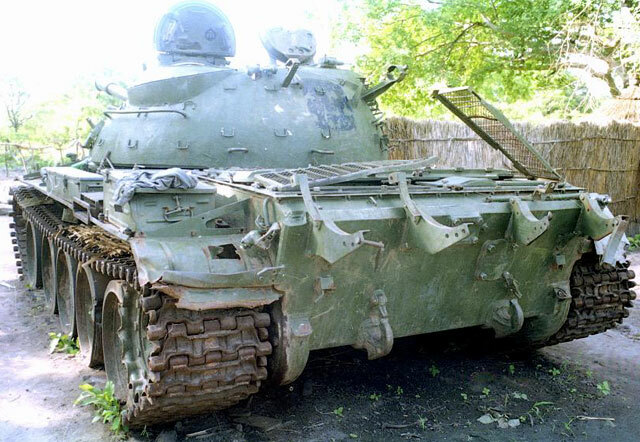 This vehicle is surely a T-55. It was manufactured in either Czechoslovakia or Poland. I can say this because of the typical commander/loader cylinders. A TPN1 stadiametric range-finder is visible, so it is surely not a Chinese manufactured vehicle. Now, which version of T-55 is it exactly? Maybe a version A if it is of Czech origins, but I can't see the typical added zip boxes on the turret's flanks (typical on both Polish and Czech vehicles). Perhaps they have been removed but it is not certain. If it is a Polish manufactured vehicle it could be a model A, too; or also a much modern AD type. 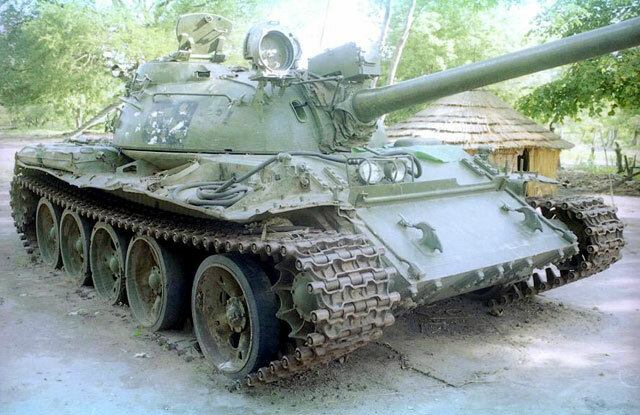 I have some pics of Ugandan T-55AM (Russian manufactured late-type T55As). It may be this variant. The third distinguishing factor is the laser range finder (added in a second upgrade after manufacture) which should be a KTD-2. I cannot see the infra-red light on the right of the main gun, but it should be there because its box is obvious on the rear-left part of the trackguard. It could be valuable to see a picture of the rear turret, because if it has a strange added extension it is surely a Polish T-55AD type. In summary, we can state that this is a vehicle that may have been built during the 1960s or 1970s in an upgrade which included the laser range-finder (which came from a 1975 program). The laser range-finder may be Czech, and I know that Czechs made a such thing themselves in the early 1980s called "Kladivo" (literrally: "hammer"). However, this isn't a Kladivo, because its shape is a bit different from that of the Russian/Polish KTD-2 which is displayed here.